Kennedy, Dorothy et al. "Haida". The Canadian Encyclopedia, 16 October 2018, Historica Canada. 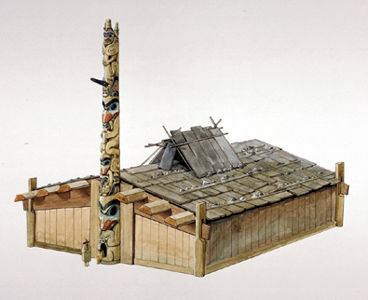 https://www.thecanadianencyclopedia.ca/en/article/haida-native-group. Accessed 22 April 2019. Haida are Indigenous people who have traditionally occupied the coastal bays and inlets of Haida Gwaii in British Columbia. In the 2016 census, 501 people claimed Haida ancestry, while 445 people identified as speakers of the Haida language. 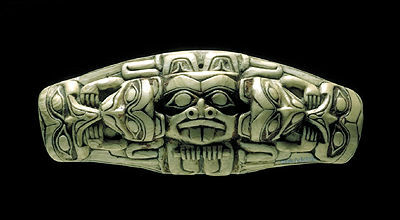 Haida charm made of bone, from Haida Gwaii (also known as the Queen Charlotte Islands), British Columbia. Some Haida canoes could hold up to 40 people. Haida copper from Haida Gwaii (also known as the Queen Charlotte Islands), British Columbia. Coppers were one of the most valued offerings at the potlatch. Rattle made of wood, pre-1880, 25.3 x 12.6 cm. Skidegate Indian village of the Haida people in Haida Gwaii (also known as the Queen Charlotte Islands), British Columbia, July 1878. 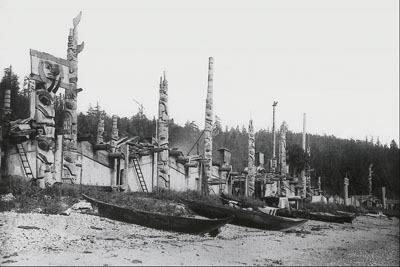 Haida proclaimed clan membership through an elaborate display of family crests, carved on totem poles erected in front of their houses. 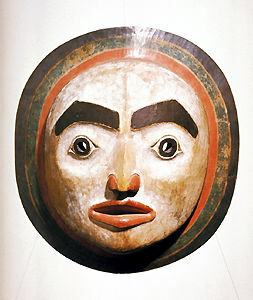 Wood moon mask, from Haida Gwaii (also known as the Queen Charlotte Islands), British Columbua. Haida are Indigenous people who have traditionally occupied the coastal bays and inlets of Haida Gwaii	in British Columbia. Archaeological evidence confirms continual habitation on the islands for at least 6,000 to 8,000 years. (See also Prehistory.) The relationship between Haida and Haida Gwaii​, which means “islands of the people,” is fundamental to traditional and contemporary Haida life. The two main population centres are Old Masset on the north part of Graham Island and Skidegate on the south-east. In the 2016 census, 501 people claimed Haida ancestry. Traditionally, each Haida village was an independent political unit and, to a great extent, each family in a village was an independent entity. 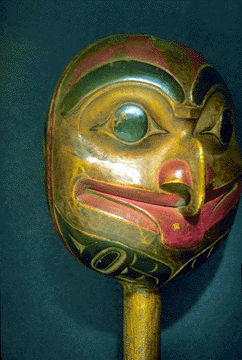 In terms of economy, the Haida traded items, such as eulachon fish, with other Indigenous nations in British Columbia, including the Nisga’a. The Haida also often ate salmon and hunted various animals, including the grizzly bear. 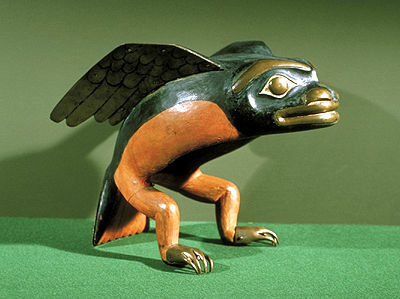 All Haida belong to one of two social groups — the Eagle or the Raven, sometimes referred to as moieties or clans. Traditionally, Haida always married a member of the opposite group. Clan membership was matrilineal, and each group contained more than 20 lineages. Individuals publicly proclaimed clan membership through an elaborate display of inherited family crests, carved on totem poles	erected in front of houses and carved or painted on war canoes, cedar boxes, masks, and utilitarian and decorative objects. Though these cultural and artistic practices are distinctive, they do share similarities with the neighbouring Tsimshian and Tlingit. 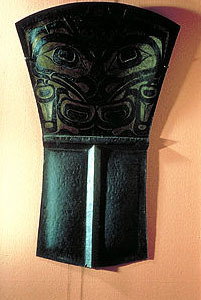 Potlatches were a focus of Haida life. Such ceremonies were a means of reinforcing the social and economic organization, and the interdependence of moieties, lineages and villages. The names of lineages were generally derived from the group’s place of origin. Lineages were property-holding groups. Property owned by a lineage included rights to certain salmon streams, trapping sites, patches of edible plants and tobacco, stands of cedar, bird rookeries, stretches of coastline and house sites in the winter village. Management of the lineage's property was in the hands of the lineage chief. The first recorded European contact is generally believed to have been in 1774 with the Spanish explorer Juan Pérez; however, some academics have suggested that Russian explorers may have contacted the Haida as early as 1741. In 1787, British Captain George Dixon initiated trade with the Haida for sea-otter pelts, and the Haida remained at the centre of the lucrative China sea-otter trade until the mid-1800s. European settlers did not significantly populate Haida Gwaii until almost 1900. The Council of the Haida Nation estimates that the pre-contact population of Haida Gwaii was in the tens of thousands, a number supported by early fur traders who recorded similar, though naturally imprecise, estimates. Though the Haida had engaged in war with other Indigenous nations, using large sea-going canoes in raiding expeditions as far south as Washington State, violent confrontations with Europeans were relatively few. Nevertheless, by 1915 their population had declined to 588 people, mainly as a result of smallpox and other diseases brought by Europeans. As Europeans increasingly encroached on Haida territories, the Haida found themselves forced onto smaller parcels of land. As a means of assimilating Indigenous populations, the Canadian government sent Haida children to residential schools, where they and other Indigenous children were forbidden from speaking their languages and practicing their cultures. Officially launched in 2008, the Truth and Reconciliation Commission of Canada (TRC) sought to guide Canadians through the difficult discovery of the facts behind the residential school system and to lay the foundation for lasting reconciliation across Canada. The Haida Nation has claimed Aboriginal title over all of Haida Gwaii, but has been unable to reach a formal treaty agreement with the government of British Columbia, and has thus withdrawn from treaty negotiations. 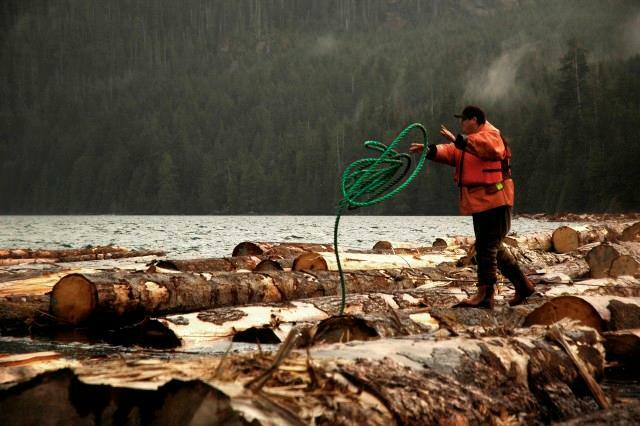 As such, the Haida have continued to negotiate with the provincial government on a government-to-government basis, and have succeeded in a number of significant negotiations including the protection of culturally significant areas, the reduction of logging by half, access to resources and related revenues, increased environmental protections, and ongoing participation in a “shared governance” model of relations rather than straightforward self-government. The Haida Nation is the rightful heir to Haida Gwaii. Our culture is born of respect; and intimacy with the land and sea and the air around us. Like the forests, the roots of our people are intertwined such that the greatest troubles cannot overcome us. We owe our existence to Haida Gwaii. The living generation accepts the responsibility to ensure that our heritage is passed on to following generations. On these islands our ancestors lived and died and here too, we will make our homes until called away to join them in the great beyond. 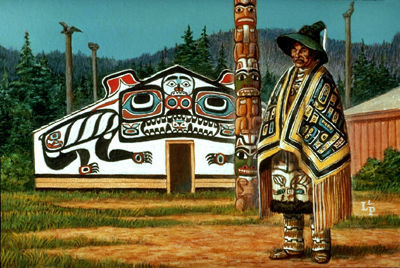 Many contemporary Haida are famous for their fine art (see also Northwest Coast Indigenous Art), while many others work as prosperous commercial fishers or in forestry. Together with Parks Canada, the Haida manage the South Moresby/Gwaii Haanas National Park Reserve on Haida Gwaii. A "Haida Gwaii Watchmen" program protects and interprets archaeological historical sites throughout the islands. Haida are also employed in eco-tourism programs, while a commercial fishery includes a Masset band-owned herring roe on kelp, known as k’aaw, license. Skidegate also holds several such harvesting licenses. The k’aaw fishery has been the subject of some controversy, as commercial fishery outfits supported by the BC Department of Fisheries and Oceans have sought licenses to harvest herring roe directly, rather than through spawning collection. The Haida, as well as the Nuu-chah-nulth and Heiltsuk, opposed these actions in early 2014. The Nuu-chah-nulth received a Federal Court ruling against the fishery in their territory, while the Haida negotiated a one-year moratorium on the commercial fishery. The Council of the Haida Nation represents all Haida while recognizing the independent jurisdiction of the Kaigani Haida who reside north of the Dixon Entrance in southern Alaska. The Constitution of the Haida Nation affords, to all people of Haida ancestry, citizenship and related Indigenous, hereditary and cultural rights, as well as individual and participatory rights. Any Haida citizen over the age of 16 may vote to elect representatives to the council, or may propose legislation or policy, subject to a vote. The Constitution also recognizes the role of village councils as well as matrilineally-descended hereditary chiefs. M.B. Blackman, During My Time: Florence Edenshaw Davidson (1982). J.R. Swanton, "Contributions to the Ethnology of the Haida," The Jesup North Pacific Expedition, Vol 5, Part 1 (1901). M.L. Stearns, Haida Culture in Custody: The Masset Band (1981). M.B. Blackman, During My Time: Florence Edenshaw Davidson(1982); M.L. Stearns, Haida Culture in Custody: The Masset Band (1981); J.R. Swanton, "Contributions to the Ethnology of the Haida," The Jesup North Pacific Expedition, Vol 5, Part 1 (1901). GWAII HAANAS NATIONAL PARK RESERVE OF CANADA The Parks Canada website for the scenic Gwaii Haanas National Park Reserve of Canada. Features online resources about Haida history and culture as well as local geography and natural history. See also the link to the "Gwaii Haanas National Marine Conservation Area Reserve and Haida Heritage Site". COUNCIL OF THE HAIDA NATION Learn more about Haida history, governance, language and more. Réserve de parc national and Site du patrimoine Haïda Gwaii HaanasSite Web de la réserve de parc national et le site du patrimoine haïda Gwaii Haanas, située dans l'île de Vancouver. Voici aussi la réserve daire marine nationale de conservation et le site du patrimoine haïda Gwaii Haanas.